Deported Palestinian Islamic Jihad (PIJ) board member Sami Al-Arian denounced the United States as "our enemy" last Tuesday at an Istanbul conference on Jerusalem sponsored by Turkey's Directorate of Religious Affairs. Ali Erbas, president of Turkey's Directorate of Religious Affairs, denounced President Trump's decision to move the U.S. embassy to Jerusalem and recognize it as Israel's capital in December. "The Presidency of Religious Affairs is with the suffering Palestinian Muslims who have been serving as the guardians of al-Aqsa for years despite any kind of invasion and violence, and will continue to be by their side and provide any kind of support for them," Erbas said in his message. Al-Arian kept his role as a PIJ official secret while working as a University of South Florida (USF) professor and Palestinian nationalist. He founded a charity called the Islamic Committee for Palestine (ICP) that raised money for the Palestinian Islamic Jihad (PIJ) and featured PIJ officials as speakers. He also formed a Tampa-based think tank called the World and Islam Studies Enterprise (WISE), which provided cover in the early 1990s for Ramadan Abdullah Shallah, who would later become the PIJ secretary general, as director of the think tank. Shallah taught at USF as an instructor through a cooperative agreement. WISE made it possible for Shallah to get an entry visa into the U.S. The ICP served as PIJ's "active arm," a 1991 videotaped fundraiser shows. Called "a master manipulator" by the federal judge presiding over his case, Al-Arian pleaded guilty in 2006 to conspiring to make or receive contributions of funds, goods or services to or for the benefit of the Palestinian Islamic Jihad (PIJ), a Specially Designated Terrorist." He was deported to Turkey in 2015 as part of that plea agreement and directs of the Center for Regional Politics at Istanbul's Sabahattin Zaim University. He has addressed several conferences, including one held in conjunction with Georgetown University's Awaleed bin Talal Center for Christian Muslim Understanding in Istanbul last September. At the Istanbul conference, Al-Arian said the 1993 Oslo Accords that had established the Palestinian Authority and theoretically led to the Palestine Liberation Organization (PLO) recognizing Israel and renouncing violence, are unacceptable. "The United States, which gives Israel so much confidence, is our enemy," Al-Arian said, telling the conference Muslims needed to stand against the U.S. That includes an embargo on the United States by Muslim nations, he said, according to exiled Turkish journalist Abdullah Bozkurt. Israel, Al-Arian said, wants to control the entire region. "He is carrying the wood to fire of anti-American euphoria Erdogan has lighted in Turkey," Bozkurt told the Investigative Project on Terrorism in a Twitter exchange. "Moreover, Erdogan uses operatives like him to make inroads into [the] Palestinian community abroad as well back in Gaza/Ramallah." While Turkey seems happy to give Al-Arian a base to stir up anti-Israel and anti-American sentiment, President Recep Tayyip Erdogan also is finding allies within the United States. Council on American Islamic Relations (CAIR) leaders met Erbas last month at the Turkish government-supported Diyanet Center of America in Lanham, Md. Subscribing to a fundamentalist interpretation of Islamic law, Erbas's Diyanet has said that children as young as 12 can marry. "The other critical issue we need to fight is Islamophobia," Erbas said last month, the Anadolu News Agency reported. "The efforts to show Islam as a minacious and dangerous religion have been increasing day by day. United States Council of Muslim Organizations (USCMO) Secretary General Oussama Jammal also attended last month's Diyanet event in Maryland. Jammal pledged his support to Erdogan last month due to the Turkish president's effort to unite Muslims. Likewise, Mahmoud ElSharkawy, spokesman for the Muslim Brotherhood-linked Egyptian Americans for Freedom and Justice (EAFJ), attended a "special meeting and breakfast" with Erbas at the Maryland Diyanet Center during last month's visit. ElSharkawy has a close relationship with exiled Muslim Brotherhood leaders living in Turkey. Egypt's Al-Bawaba newspaper identifies him as a member of the "International Organization of the Muslim Brotherhood." CAIR also held its weeklong "Leadership Development Program" for the leaders of its various chapters in conjunction with Georgetown University at the Maryland Diyanet Center last week. 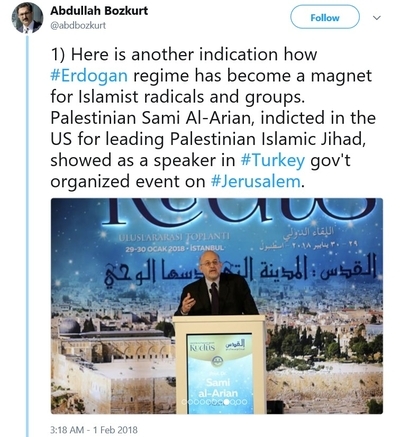 "[The meeting with Erbas] was part of Erdogan government's systematic and deliberate campaign of wooing U.S. Muslim leaders, mainly Brotherhood figures, with a view of creating a proxy group so that he can mobilise (sic) them for political goals when he needs it down the road," Bozkurt said. "I think it undermines the national security of the US when a foreign power, especially a dangerous Islamist like Erdogan, tries to meddle into communal affairs, support proxy groups and provide sanctuary when Islamists kicked out of the U.S.," Bozkurt said.